Prime Minister Jacinda Ardern is again making global headlines, this time at the Asean conference being held in Singapore. The media are making much about United States vice-president Mike Pence who requested to be seated beside Ardern at the gala dinner. Whether she can get any traction on the US lifting trade tariffs on New Zealand steel and aluminium is yet to be revealed. Interestingly, Ardern met with Myanmar leader Aung San Suu Kyi to offer her any help New Zealand could give to resolve the Rohingya crisis. In earlier days, it is likely the Myanmar leader would have been a hero for Ardern, given her battle over many years to see a democratic election held in her home country. Now, Aung San Suu Kyi is regarded as an international pariah for her failure to save the Muslim Rohingya from ethnic cleansing and being forced off their lands into Bangladesh. She met and exchanged banter with Australian Prime Minister Scott Morrison, though the banter initially was about whether Bunnings could direct where people put the onions in the sausages sold in fund-raising barbecues outside the trans-Tasman giant’s stores. The big question everyone wanted to know was whether Morrison was going to relent and let Ardern bring to New Zealand some of the asylum seekers on Nauru and Manus Islands. Morrison said recently he had got to his knees and prayed about the future of the asylum seekers. Well Hello Scott. Their salvation is in your hands not those of your God. It is unlikely asylum seekers from Nauru and Manus Islands will arrive in NZ. A vocal minority are ready to chain themselves to a barrier in their belief this country should take the asylum seekers. However, many New Zealanders feel it is not the best outcome. Back at home, Justice Minister Andrew Little has given the go ahead for the entry into Pike River Mine, eight years after 29 miners were killed in a devastating explosion. Former prime minister Sir John Key promised to “bring the men home”, but National eventually ruled out a recovery because of the danger. New Zealand First leader Winston Peters promised before the last election to be the first into the mine, something which will not happen because of the danger associated with the re-entry. Many of the grieving families are celebrating the fact their loved ones are being brought home, or at least what is left of them. A total of $36 million will be spent trying to recover bodies, a lot of money and an amount which is dividing New Zealand. Again a vocal minority are calling this a victory. But a few people have been brave enough to stick their heads up above the parapets and ask whether the mine was better left as a tomb to the dead miners. There is a tramping track named in their memory and not all families want their dead disturbed. The Government is seeing this as good news and will play it to the maximum. Former mine manager Peter Whittall, a rest home manager in Australia, is being painted in a particularly bad light as people look for a scapegoat. And speaking of scapegoats, the world focus on Ardern and Pike River mine is distracting Kiwis from the general dysfunction of the Government. Regional Economic Development Minister Shane Jones failed to disclose 61 ministerial meetings to the Opposition. Jones was forced to correct 20 answers to questions from the National Party, something for which Clare Curran was sacked as a minister. National claimed some of the meetings were to do with the $3 billion of public money Jones has responsibility for as the regional economic development portfolio. National MP Paul Goldsmith said the corrections left a question hanging over whether the actions were deliberate. Earlier, forestry officials working on the Government's flagship One Billion Trees plan ordered more than one million pine seedlings for a block of land so choked with scrub and weeds planting could not go ahead. Jones told the Herald “ambition” and “enthusiasm” had a part to play in planting delays which struck the $32 million inaugural joint venture on the Far North forestry block. Official documents show the Government planned to plant 1100 hectares with pine this year and had ordered about 1.1 M seedlings for that planting. The number of seedlings able to be planted collapsed to 191,000 as the condition of the land was revealed. And then there is the ongoing debacle of KiwiBuild houses not being cheap enough for anyone but middle income earners and above. Labour once stood for helping the poor. Now it helps those who can afford a $650,000 house and win the “lottery” of the ballot. Immigration Minister Ian Lees-Galloway still has not been sacked for granting quick residency to a Czech drug smuggler. If only the National Party had a leader who could make the most out of these slip-ups by the Government. Dene Mackenzie is a Dunedin political commentator. 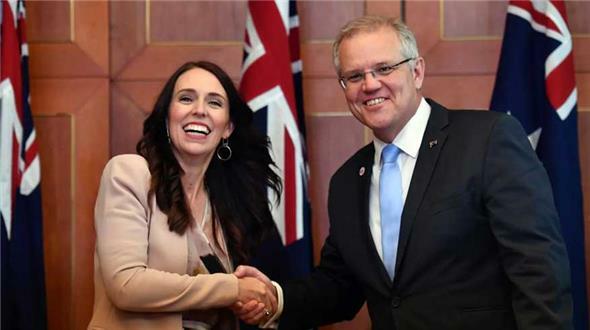 Jacinda Ardern with Australian Prime Minister Scott Morrison at the Asean Conference. Photo: The Australian.